Remember when the ideal word count for a blog article was 500–700 words? In 2012, experts were suggesting that this was the sweet spot because people could quickly read the post and share it, read a little, bookmark it and come back, or do whatever they were going to do next. From there, it evolved and people and search engines wanted more well-researched content with more in-depth sources. This leads to higher-quality content overall and boosts a brands image. 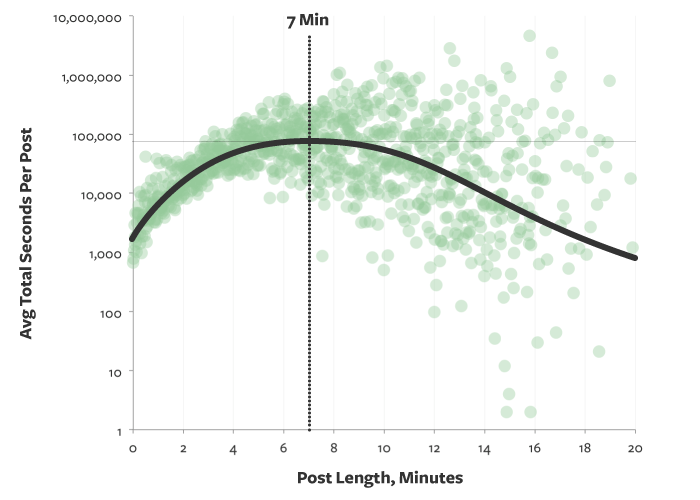 Experts in the industry were saying in 2014 it should take seven minutes to read the post—that’s 1,700 words, thus leading to Snap’s accurate prediction about the best blog post length for 2015. Check out Snap’s Web Design & SEO Services to help you have success in driving traffic and conversions. We also service customers in need of local SEO all over the country. We predicted in 2015 it would be 1,400 to 1,750 based on data and industry experts projections. You can view that post here. The data supported that the proper length trend continues to expand. We supported that claim with research from Moz, Serp IQ and Medium. 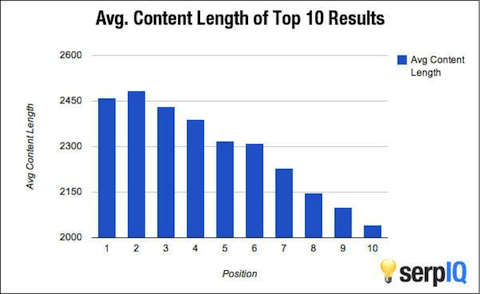 New data is coming out about the ideal blog article length for 2016 from data champions HubSpot, who suggest that, in their experience, content that exceedd 2,000 words is performing the best in terms of social shares and backlinks—two of the most important metrics for success online that lead to more traffic and more customers. Why are people sharing these giant posts on social? Perhaps the desire to be the one to turn people onto a seriously valuable resource drives consumers to share deeply informative “big content.” As content marketing as a valued marketing segment grows, we’re employing more writers who can research these subjects and provide value, in turn boosting our online presence and increasing our SEO success. It can be a good thing as long as search giants like Google keep providing incentives for solid content creation and not the blackhat hacks to search engine dominance. Mind you, we’re not talking about sheisty posts that don’t serve a need and are just stuffed with keywords. These posts fall flat on their faces, and as soon as Google and other search engines catch on to the fact that you’re using underhanded techniques to boost your business, well, you’ll be dead in the water. Google changes its algorithm about 500 times throughout the year, meaning it won’t be long before they notice your unwelcome digital marketing strategy. As long as you’re providing value to your market, you’ll be rewarded with visitors – and hopefully you’ll catch a windfall of conversions. Mind you, this is one website; but clearly the in-depth content attracts more eyes and social shares. If that’s not enough for you, below you can see how this length is affecting organic traffic. 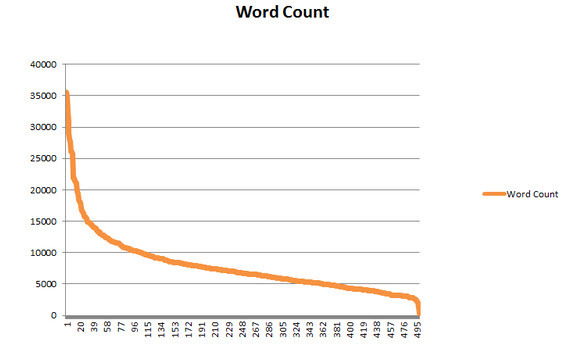 As you can see, the ideal length of word count vs. average organic traffic is sitting pretty at 2,250-2,500 words. Mind you, this is the big picture currently, so likely the best blog length for 2016 will continue to go up beyond my or your ability to satiate! In 2016 the ideal blog post length will continue to go up to 2,500 words; in fact, it’s already getting there. Leading up to 2016 we see the trend moving in the same direction upward, as people on the web are now reading and perusing content in a different manner. A recently-posted ginormous article, “What is code?”, went somewhat viral at a length of 38,000 words despite its intimidating size and relatively niche demographic. It was the thoughtfulness, well-researched information, and storytelling that allowed it to survive like that on the web. It also had its own theme and, for that reason, was glistening with high-quality content. People want information that will help them advance in both their careers and personal lives, and giving them the resources to improve their situation, whether professionally or personally, is extremely important for a brand to provide through their website. This is the 2,250-2,500 words we’re talking about as ideal in 2016. We aren’t talking about thrown together, unrelated nonsense where its only purpose is to shoot up the search engine results pages and get penalized as soon as Google notices. The key point to remember here is that people want to uncover more challenge and insight in content when they write 2,250-2,500 words and have to make multi-facted points with examples that extend beyond the simple 600–700 words of yesteryear, and the 1,500 hundred word count for blog posts of last year. It’s no secret that in-depth content performs better in search engines. 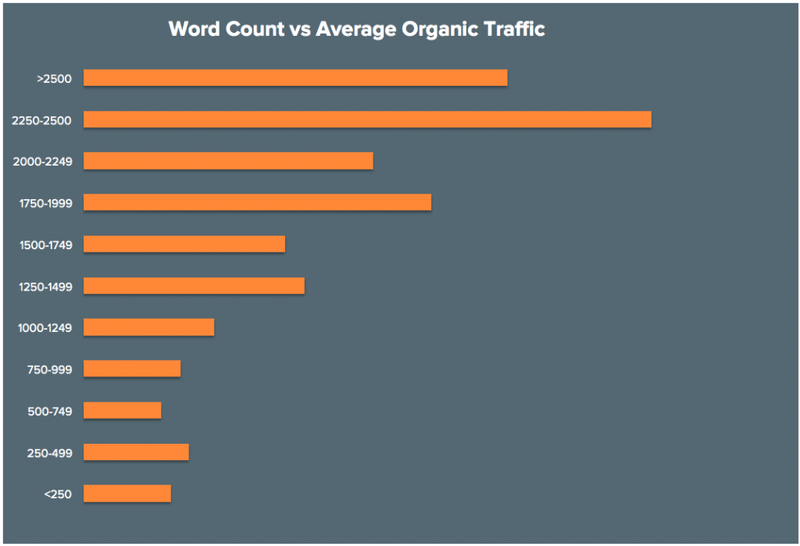 We’ve been touting the benefits of high word count in content to ecommerce SEO for years, in fact. Take a look at the graph below which has data that comes directly from Google itself. 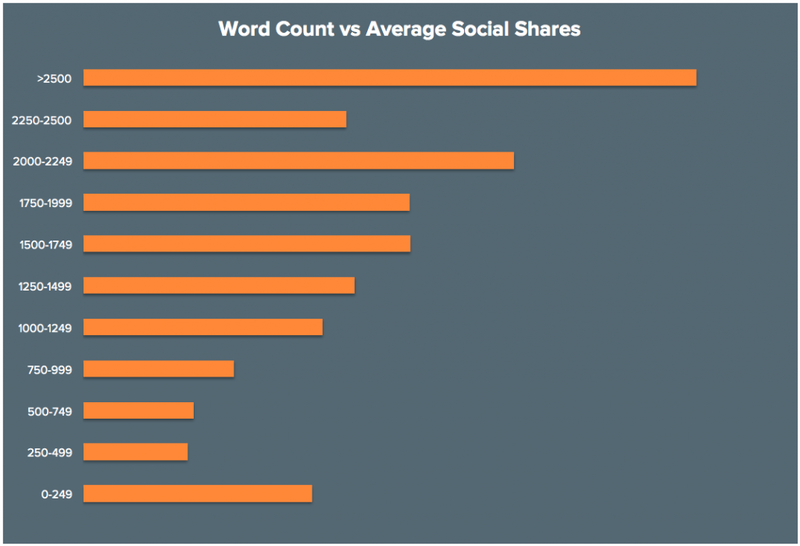 As you can tell, the number one position across all industries sits right above 2,450 words. Granted, this takes into account all page one content. Think of content-heavyweight Wikipedia. Whenever you Google a subject, you’ve undoubtedly seen Wikipedia show up in the search results time after time. That’s because Wikipedia’s sole purpose is to provide high-quality, informational content–and a lot of it. Model your website in that same vein; turn your brand into a resource for the niche that you serve. That just illustrates our point that the more words that you can use to discuss a certain topic, the better it will inevitably perform in search. You might be thinking that creating that kind of content is not in your schedule this week, and you may be absolutely right. Guess why it still matters? People that invest the time to create this kind of in-depth content are clearly enthusiasts of some type or have invested resources in creating this content. If you don’t have time for it, perhaps your competitor does and will reap the benefits of the investment of that time sharing their experience and expertise. If your’e struggling to come up with killer content ideas, consider conducting a competitive analysis of competitor websites. What are they doing that’s getting a lot of shares? You can run a backlink check on a free tool like Moz’s High-Quality Inbound Link tool to see if competitor content is being shared on publication websites. Take ideas that your competitors have and re-purpose them into infographics, white papers, blogs, ebooks, webinars, vlogs, podcasts or SlideShares. Make sure they’re of the highest caliber and you’ll grow your organic traffic through better backlinks and more social shares. Another way to save time in creating world-class content, is to conduct an audit of the content that currently lives on your site. If you’ve had a website for more than a year or two, you most likely have out-dated and poor-performing content on your website. Let’s say you ran a blog in 2010 promoting a piece of now-defunct technology, like a desktop computer. This page is probably not driving much traffic, since people have now moved on to buying the 2016 version of the technology. This content serves no purpose, and while it may not necessarily be hurting you (although it certainly could be…), it’s no longer providing value to your customers. What you can do is kill the page and re-use the content elsewhere, or update the existing page to fit current specifications and information. Read more about content auditing here. A great strategy in boosting your content performance is to conduct keyword research. Finding keywords that are highly-searched, yet low in competition, and integrating them into your copy is how your content will thrive when it comes to ranking in search engines. Investing time into proper keyword identification is imperative to your long term success on Google search engine results pages. If you’re curious how to do keyword research, Google provides a variety of free tools for you to find your desired keywords for the best SEO. Head on over to Google Keyword Planner and start a free account. Under the “tools” section, click the top drop down arrow under “find new keywords and get search volume data”. Fill out the text boxes below, under “your product or service”, and type in every query you think relates to your business, niche, industry or specific content. You can also put in a landing page, product category, location-target, language-target and more. Familiarize yourself with this program, because it’s going to become your go-to tool in finding keywords and integrating them into your website. The results should give you hundreds or even thousands of possible keywords that you can rank for. The trick here is to identify long-tail keywords, which are keywords that have more than three words, and which have a higher conversion rate. Once you find a few, pull them off and document them in a spreadsheet. Ensure that you’re also finding high-volume, low-competition keywords. As you see in the result pages on Keyword Planner, you find three metrics, “avg. monthly searches”, “competition” and “suggested bid”. You should pay attention to the first two, as suggested bid is something you’ll only use if you’re employing AdWords. For content purposes, however, we’ll focus on average monthly searches and competition. Average monthly searches is the search volume for the given query over the course of a month. The higher this number is, the better — but only if competition isn’t marked “high”! Low to medium competitive keywords are the ones you want to target. Find keywords that relate to your article and use many variations throughout your copy. The days of keyword stuffing are long over, and will negatively impact your site. The new strategy has evolved from keyword stuffing to keyword differentiation and variation. For example, if you’re writing an article about a health-boosting supplement, find a main target keyword related to that subject and use it a few times. More importantly, use different variations of that keyword: All-natural supplements, health vitamins, supplements for soreness, vitamin supplements, and so on. A piece of content employing this new-age strategy will cast a much wider net and Google will be much more inclined to show your page for the given search queries. If you’re wondering how to write this type of long-form content, take a gander at our video, by Snap SEO Strategist Abby Olson, in which she gives her hints and tricks to writing Google-topping articles. It’s incredibly important to build your foundation of knowledge on your website so search engines know what to rank you for. We know that the ideal length is 2,250-2,500 words for top performing search results. So where do we start? As Abby details in the video above, the best place to start is keyword research, as detailed above. Start with long-tail keywords, queries that are three to four words or longer, which are used by 70 percent of people using the web. While short-tail keywords (shorter than 3 words) are important, they aren’t as detailed and are less likely to convert because the people searching for them are in the beginning of their search path. Write content as if you’re talking to your users. What do they want to know? What are some frequently asked questions that you often receive? How can you tie in other aspects of your business so you can group related pieces together? You need to anticipate what your user wants to know and needs to know, or what he wants to get out of your website, and offer that information so he doesn’t even have to look for it. Content can exist in many different forms. Content pieces that Snap often uses are landing pages, which are very conversion-friendly or rankable for a certain keyword. Service or product pages, which are more actionable. Content hubs, which are substantial pieces of content that act as a hub to connect supporting content through, increasing link juice and bot crawling capabilities. And of course blog posts, which are also extremely useful in ranking in niche industries, keeping up-to-date with industry announcements and sharing important company news. It’s extremely important to abide by the conversion funnel, as seen in the video. With this writing strategy, you’re writing content based upon where the desired user is in their search journey. Like we said before, content and keywords are utilized differently depending upon which stage the searcher is at in their purchase path. If they have a problem with their car, for example, they don’t know what it is, they’ll most likely search “engine problems.” An article discussing common engine problems may be the desired page for that stage of the search, as the searcher “informs” themselves of the problem they’re facing. Once they pinpoint the problem, they’ll get more specific, using “investigative” searching “water pump leak”. A video showing how to identify and remove a water pump would be useful in this stage of the search. In the final stage, they’ll take a specific “action”, searching “buy water pump for 2004 Chevy Corolla.” A keyword-rich landing page, service page, or product page will yield the results that they’re looking for as they make a purchase. Strategies to amp up on the bigger (more in-depth) blog post. 1. Start with the big idea sections. 2. Think about why anybody should care about the subject. 3. Why is your particular experience with this subject interesting? Share stories. 1. Consider coming up with several related post ideas and combine them. There’s nothing wrong with a more comprehensive, multiple chapter approach. 2. Boil down your main points into headlines to accomodate skimmers who may still want to share your content. 3. Address questions people might have related to the subject.